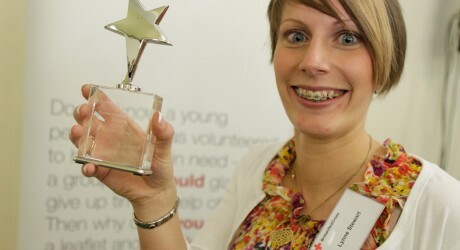 YOUNG Scot, Lynne Stewart, has picked up a top humanitarian award from the British Red Cross. The 22 year-old from Elgin, Moray, was chosen from dozens of young people from all over the UK to win the volunteering section of the Red Cross Humanitarian Citizen Awards. The annual awards celebrate the extraordinary and selfless achievements of young people throughout the country. In 2007, Lynne volunteered at a children’s home in India. She has returned several times since. Through her vision, hard work and enthusiasm she has created a charity, Volunteering Connect Cultures, to offer others the chance to volunteer in India. Lynne also volunteers for a local youth café in Elgin and is a member and fundraiser for RotarAct. She was one of 17 young Scots who made it through to the finals of the Humanitarian Citizen Awards, which were presented at a ceremony in London at the weekend. Lynne, a fourth year honours student in business studies at Aberdeen University, said: “I feel very happy to have won the HCA award for volunteering. Being a volunteer is something I enjoy, as I like to give my time to others. The overall winner for 2010 was 15 year-old Cameron Foster from Wigan. Five years ago, Cameron broke both legs and an arm in a ski accident and, during his long recovery, became keenly aware of how frustrating it must be for disabled people to feel excluded from sports. Since then, Cameron has done countless sponsored runs and walks, and notched up quite a few abseils – including abseiling down Old Trafford – on his way to raising £10,000 to buy specialist sports equipment for disabled people. The Humanitarian Citizen Award is kindly sponsored by Canon, who have supported the award since it began in 2005. Social media links: follow the British Red Cross in Scotland on Twitter and Flickr. MEDIA RELEASE posted by the British Red Cross (Scotland). You too can post media releases (aka press releases) on allmediascotland.com. For more information, email here.